SEATTLE – Many African nations have made substantial progress in vaccinating children against life-threatening diseases; however, within countries wide discrepancies remain, according to a new scientific study. 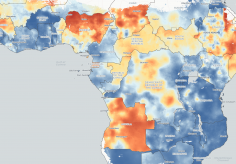 The study, “Mapping diphtheria-pertussis-tetanus vaccine coverage in Africa, 2000-2016: a spatial and temporal modelling study,” maps nations in fine-scale, 5x5 kilometer increments, so that health officials nationally and locally can identify gaps in vaccine coverage and target interventions with precision, tailoring health policy decisions at local levels. The study is the latest in a series of IHME papers as part of the institute’s Local Burden of Disease (LBD) project, which produces estimates of health outcomes and related measures covering entire continents at a fine resolution. The project is seeking additional collaborators, including academics, researchers and others, to contribute data and to evaluate draft papers. For more information, please contact the LBD Engagement Team at [email protected]. The Local Burden of Disease project at IHME aims to produce estimates of health outcomes and related measures that cover entire continents, but to do so at a very fine, local resolution. Such estimates allow decision-makers to target resources and health interventions precisely, so that health policy decisions can be tailored for local areas rather than entire countries. Combining local detail with broad coverage – producing 5x5 kilometer estimates for entire continents and, eventually, the world – would give health officials everywhere the tools to make locally informed decisions and, in the process, help all people live longer, healthier lives. 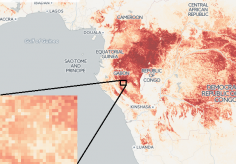 The Local Burden of Disease project is led by Dr. Simon I. Hay, Professor of Health Metrics Sciences at the University of Washington and Director of Geospatial Science at IHME.